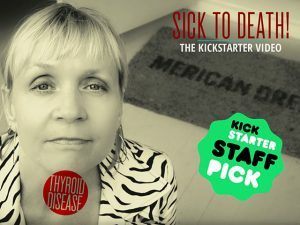 Sick to Death is a film in the works about the mismanagement of thyroid disease in the standard health care model. Although the film maker doesn’t delve into managing autoimmunity, she does address the neglect and dismissal that so many thyroid patients suffer through today in the standard health care model. We have received thousands of emails from patients who have gone from doctor to doctor only to be told they are fine. Like Hashimoto’s Awareness, Sick to Death is another project by a frustrated thyroid patient to bring more awareness to thyroid disease and improve medical care. A year ago I withdrew from Cymbalta. Almost immediately I developed dysarthria. A couple months later dysphasia. Things progressed to affect my right hand coordination. Then in December I developed dizziness and balance issues. Have fallen 6x in the last 4 months. Last fall I had an MRI done. The Neurologist didn’t see evidence of stroke or brain tumor. All he had for a remedy was voice therapy. I knew there was something else going on, so I didn’t do it. I’m now seeing a Naturopath who found out I have Hashimoto’s. She has started me on homeopathics. I’m off soy, gluten, coffee and commercial milk products. I notice now that my hip pain is gone. The fall before, I also had a pneumonia and shingles vaccine. Wondering if these affected something. Dr K recommends gargling an tongue suppressors, but don’t know if it would help after a year. What about galantamine? Do studies show this helps with speech problems? I’m getting scared and desperate at this point. Linda check out the free depression video posted on this site, “what’s causing your depression” Dr K talks about hip pain and speech problems and what might be causing it and how this may be an indicator to a serious problem. At Linda apologies for what you are going through.I hope you find help soon.